Humanitarian organizations are afraid of losing their operational licences if they assist Grace Mugabe's Arnold Farm evictees, without the approval of the government, the villagers have said. In March, the First Lady evicted over 100 families from Arnold Farm in Mazowe, intending to extend her empire and place wildlife on that land. 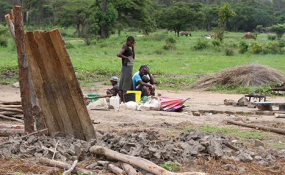 The dejected families settled at the farm acquired by the government at the turn of the millennium when the President Robert Mugabe administration embarked on the land reform programme. Most of the affected are Zanu PF supporters and former liberation war collaborators who also actively partook in the violent land seizures during the fast track land reform programme. Grace already runs an elite orphanage centre at the nearby farm. Since March, the families have been living in the open. Innocent Dube, the evictees' representative, told reporters Wednesday that NGOs were afraid to assist them. "We have approached a number of such organizations which give humanitarian assistance pleading for tents and food stuffs for our families but they are all saying that they cannot come to the First Family's farm and assist us without being authorized by the government," said Dube. "Some of the organizations we have met with include Red Cross which told us that they cannot help us without being given a go ahead by the government. We also approached International Organization for Migration (IOM) and they told us that they cannot give us their tents because they have their organisation's logos." The dejected families also turned to the Southern African Development Community, (SADC), for the regional bloc's intervention over the forced displacements.